Love this parody of the Hart to Hart TV show intro with Adam Scott and Amy Poehler. For those of you who don't remember, Hart to Hart was a mystery series that ran in the late seventies early eighties about a rich couple who liked to solve murders in-between shopping trips. They were quite good at it. The show starred Robert Wagner and Stephanie Powers. Last year Adam Scott did another side by side parody of the show Simon and Simon with Jon Hamm. Simon and Simon was a show about two private eye brothers. Love this one as well. If you get Mystery Playground updates via e-mail, you have go to the site to see the videos. Stumbled upon this restored 1968 Ford Custom 500 police car on display the Sunset Magazine Celebration Weekend by the Menlo Park Police. The car wasn't actually used in Menlo Park. It was a police car used by another city's police department although identical to what the Menlo Park police had at that time. Any any event, its a lovely working car with a V8 engine it's 1968 radar restored. The vehicle is privately owned by Communications Officer Darryl M. Lindsay. Thank you for sharing your vehicle with us Officer Lindsay. All summer long Mystery Playground is featuring Friday guest bloggers who recommend a book with a matching drink. Today's guest post is by Siobhan Nash, the woman behind the fabulous food blog, Food Fixe. 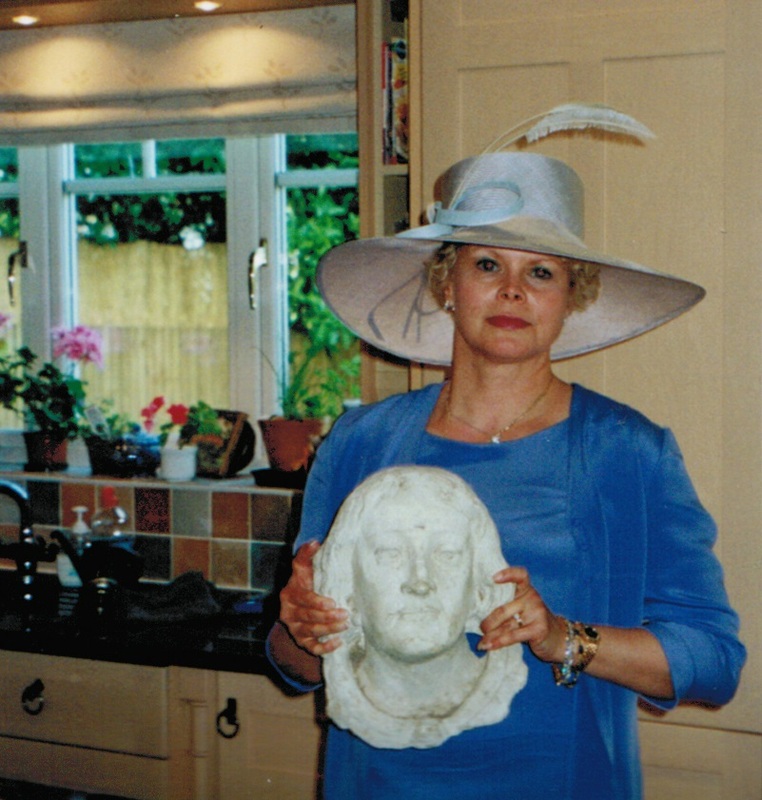 I discovered Jane Cleland's Josie Prescott Antiques Mystery series last year when I was on medical leave and doing a lot of reading. For me, Deadly Appraisal was like reconnecting with an old friend. I have long been a lover of mysteries, starting with Nancy Drew when I was a girl. At some point, though, mysteries and I lost touch. But that's the beautiful thing about a true friendship, you can always pick right up no matter how much time has passed. And in Josie Prescott, I had found a new friend. Josie Prescott is an antiques appraiser who, after blowing the whistle on her employer (a high-end antiques auction house in New York City) for price fixing, moves to Rocky Point, New Hampshire and opens her own antiques business. As seems to be the case with all small Eastern seaboard town (Cabot Cove, Maine, anyone? ), there is a steady stream of murders—all of which touch Josie’s life in some way. 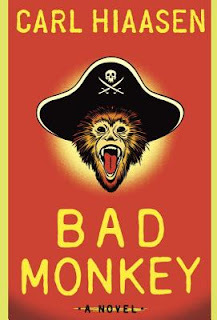 Although I chose Deadly Appraisal for my summer reading recommendation, I’ve really enjoyed all the books in the series. The plots are well developed and the characters engaging, especially Josie. In addition to living the life I dream of (minus the murders), she (like me) loves a good cocktail and likes to mix it up—from a simple Bombay Sapphire on the rocks to the more exotic Guavatini and Cherry Blossom. Champagne and bourbon haven’t made an appearance as one of Josie’s cocktails, yet. 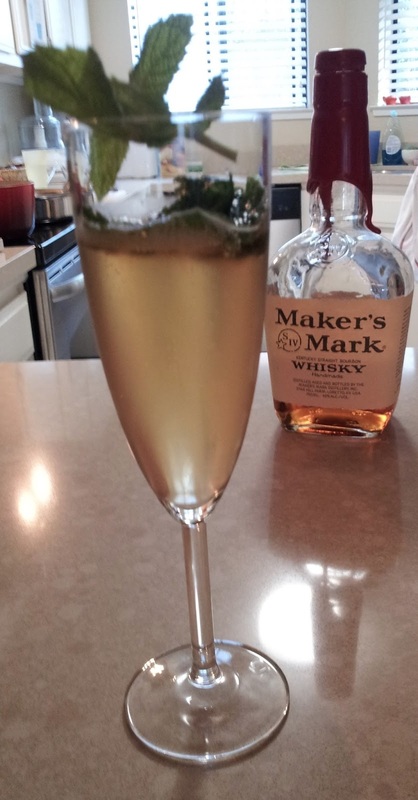 However, they are two of my favorite spirits and when I saw a recipe for a Champagne Mint Julep, I knew I had to try it. I tweaked the recipe, adding a touch of sweetness. The result is a cocktail that’s not too strong, not too minty, and with just enough effervescence. I hope you enjoy it. Twist the 8 mint leaves to release their oil and add to a champagne flute. Add the simple syrup and gently muddle with a spoon. Add the bourbon to the glass and then top off with champagne or sparkling wine. Add a sprig of mint for garnish. Cheers! Don't forget to visit Siobhan's blog, FoodFixe. I love the recipes here. Great food and the directions are clear and easy to follow. Author Tess Garritsen is giving away great prizes to raise money for Alzheimer's research at the Scripts Research Institute. Each donation gets you a chance to win prizes including a character named after you in Tess' next "Rizzoli & Isles" thriller. That would be very fun. Her goal is $25,000 and she's got about $5000 more to raise. The donation page is here. - Two opportunities to name a character in Tess’ next “Rizzoli & Isles” thriller, coming in 2014. The named character’s role in the story is up to the discretion of the author. Don't forget that Tess is also a Guest of Honor at the world's largest mystery convention this year - Bouchercon. It's in Albany, NY in September and there are more details about the conference here. If you are receiving Mystery Playground via e-mail you will have to click the link to go back to the blog to view the video. 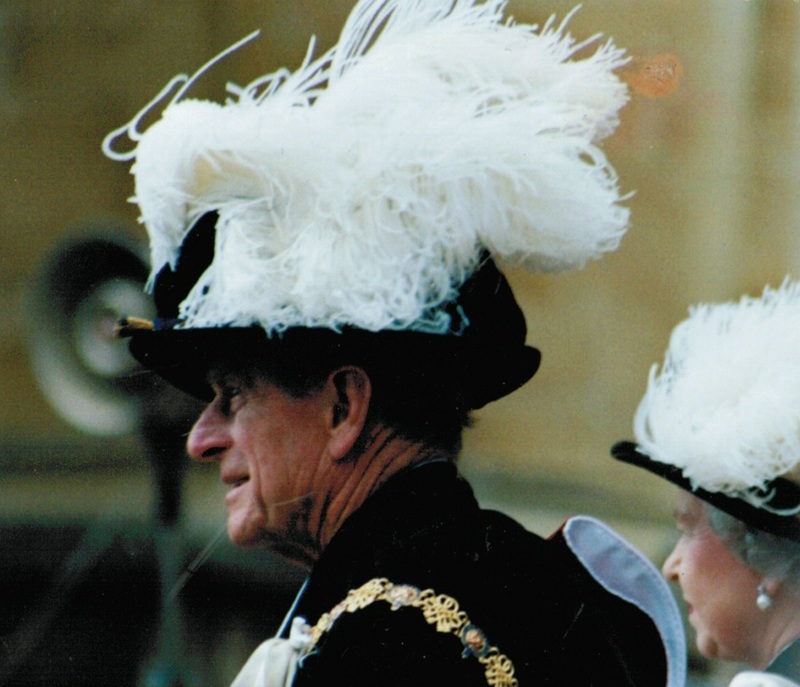 Today's guest post is from the fabulous Kim Hammond. "We were...going over our bucket list of writing projects we never got to do and it turns out we both wanted the same thing." The writers corresponded via email and the phone on their drafts with Evanovich doing the final polish on the book. 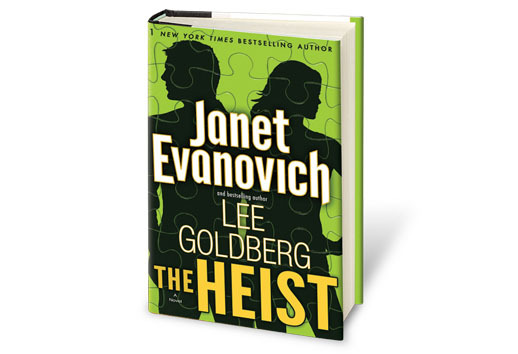 THE HEIST tells the story of a cat-and-mouse game between a former Navy SEAL and the conman she can't stop thinking about. FBI Special Agent Kate O’Hare is known for her fierce dedication and discipline on the job. Her boss thinks she is dedicated and ambitious and her friends think she’s obsessed. While Kate has made a name for herself for the past five years the only name she’s cared about is Nicolas Fox—an international crook she wants, in more ways than she should. The book was released on June 18, 2013 and the two authors strode into the Barnes & Noble at Crocker Park, outside of Cleveland, Ohio to rowdy cheers. Since this was such a big event you had to check in and get a number. I had pink #35. Not too bad I thought, until the man said I was the fourth color in line. There were 234 people ahead of me. Ouch. I trudged to the designated “pink” standing section to take my spot, while mentally calculating how much time I had on my meter. We were on the first floor and the signing was taking place on the 2nd floor. I could see a line of people running around the entire perimeter of the second floor, guided by special green balloons flying high and made just for the occasion, saying "THE HEIST”. Fortunately my group got to stand near the cards and journals so most of us milled around, shopping of course. Before you ask, yes, I did purchase a few things too. I think this might have been B&N’s secret plot to sell more this evening. Thirty minutes later a cheery barista from the on-sight café brought over a tray of freshly baked chocolate chip cookies, gratis. Brilliant again B&N. While time ticked by you could hear snippets of conversation. People trading favorite Monk episodes and Stephanie Plum moments. There was very little grumbling and we excitedly watched the signing taking place above us. I was fortunate to have met Evanovich 7 years earlier at Sleuthfest in Florida. It was a small venue so I was actually able to chat with her and get a few books signed. But I had never met Goldberg and Monk is one of my favorite shows. My sister’s also a huge fan and she mailed me a few of her Monk books from Denver so that I could get them signed for her. We got the high sign from our “pink handler” that we could head up the escalator and there were cheers and smiles all around. Unfortunately the next book section was Biography so we had to find other ways to entertain ourselves. After about 40 minutes we were in the home stretch. Sticky notes were handed out so you could write down your name for personalization and we were told to have the book(s) open to the correct page and ready. The pressure was enormous, no room for error. They wanted to get the authors done at a decent time so there wasn’t a lot of lingering. 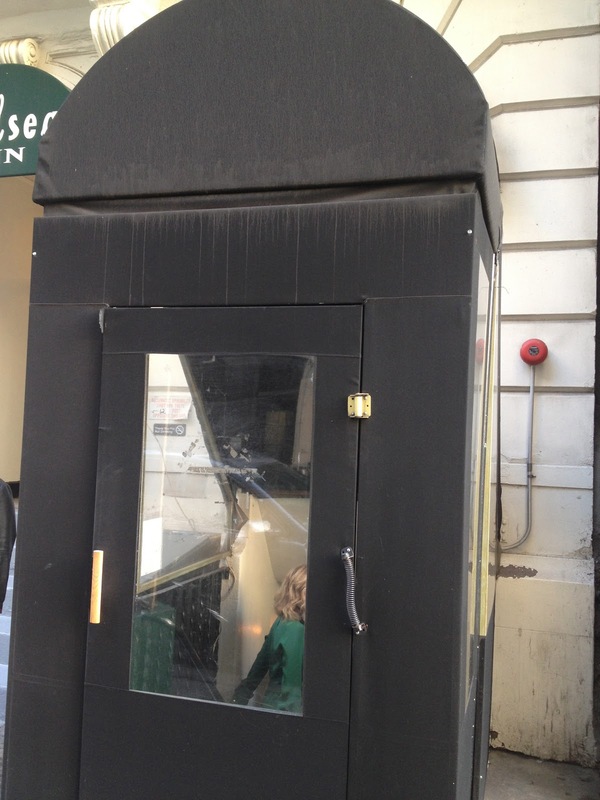 But you could still take pictures and there was no limit on the number of books to get singed (I had five). Three hours after I arrived I had my booty and was heading to my car with meter time to spare. Hats off to B&N for a smooth signing under pressure. They had called in extra employees from other stores for crowd control and were efficient and orderly. In case you live under a rock and don’t know who these authors are: Janet Evanovich is the #1 New York Times best-selling author of the Stephanie Plum series. Lee Goldberg is the best-selling author of the Monk series, as well as a screenwriter and producer. 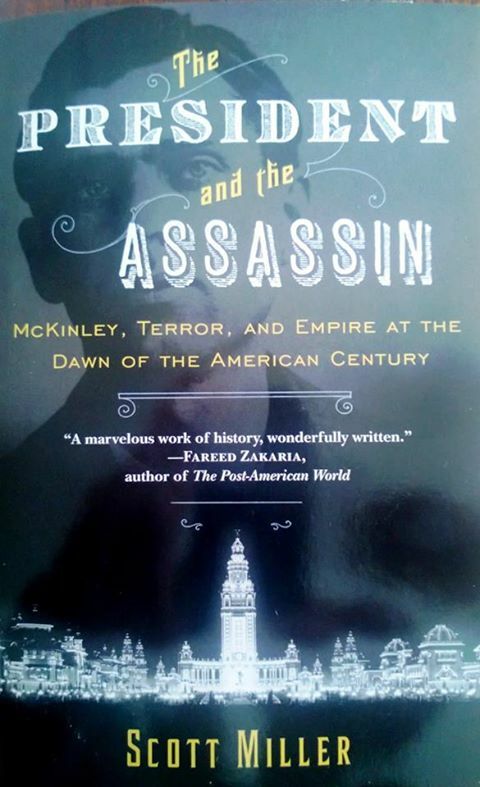 He has served as a board member for the Mystery Writers of America has earned two Edgar Award nominations for his television writing and was the 2012 recipient of the Poirot Award from Malice Domestic. This video of sad cats complaining about such tragedies as "the authorities" leaving their food bowls half filled is just too funny to miss. All summer long Mystery Playground is featuring Friday guest posts matching drinks with fabulous summer reads. Today's post is from Bella McGuire at Cozy Mystery Book Reviews. With the summer weather around the corner, I love sitting outside enjoying a good mystery and a nice glass of Lavender Lemonade. Some of the great books I look forward to starting this summer are: Father Knows Best by Jeffrey Allen, Steamed to Death by Peg Cochran and A Cookbook Conspiracy by Kate Carlisle. Looking for something a bit edgier? I highly recommend Joyland by Stephen King, a serial killer at a carnival, with a great summer feel. Over medium heat, combine two cups of water and sugar, bringing to a boil until sugar is dissolved. Remove from heat and stir in agave nectar and dried lavender. Cover for about 15 minutes, allowing mixture to steep. Strain lavender, making sure to release all juices and syrup. 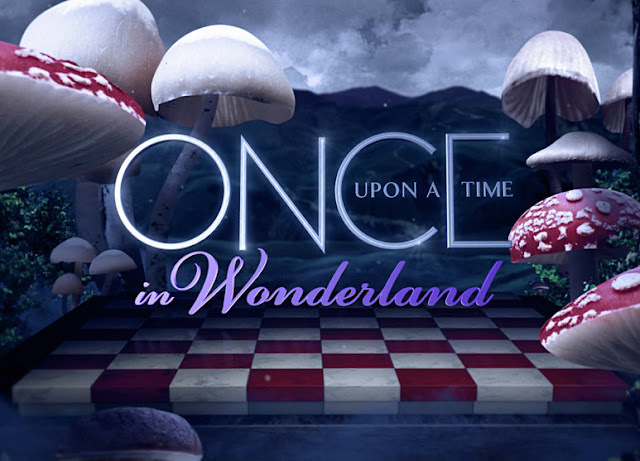 It's no secret that I am a big Alice in Wonderland and that I also love the show Once Upon A Time. ABC has announced a new show this fall called Once Upon A Time in Wonderland. The premise is that Alice's father thinks she's crazy and that she never went to Wonderland. There's no white rabbit. No Queen of Hearts. No Cheshire Cat. Of course if we believed that, it would be an entirely different show. Of course this time Wonderland is real and Alice winds up going right back down the rabbit hole. As much as I love the whole Alice story, I am curious how this will play out against the original Once Upon A Time. After all in Storybrooke, the Queen of Hearts is already dead, there is a Mad Hatter alive and well, and I've always though that Emma was really Alice and she didn't know it. I know it's a separate story, and suspended disbelief is necessary in fantasy shows, but still. My jury is out. Will I watch it? Of course, I'll give it a shot and keep a look out for details from the new show. 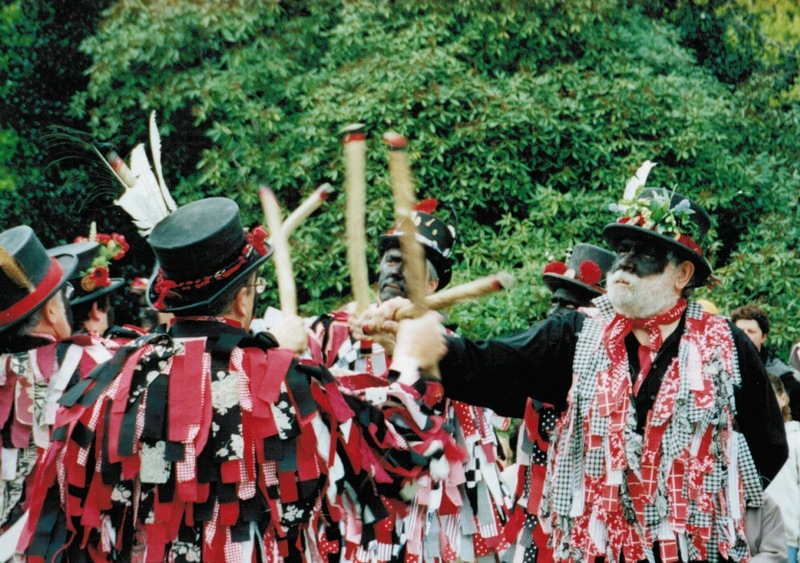 Today's guest post is by the fabulous Kim Hammond. Many authors are generous with their time and give talks on the craft of writing. They offer advice, tell their horror stories, and share their love of fiction writing. I love attending these talks and was fortunate to be able to attend one put on by the Cuyahoga County Public Library. The author in residence was New York Times bestseller Taylor Stevens. Right from the introduction she wanted you to know her background so you would better understand her comments and advice. The audience sat mesmerized as she described what sounded like the plot of a thriller, but was actually her own life growing up. Born in New York state and into the Children of God cult, she was raised in communes across the globe and denied an education beyond sixth grade. Forbidden books and television, she secretly obtained a notebook and wrote her own fiction, only to be discovered and severely punished, her stories burned. Stevens was in her twenties when she broke free and entered the foreign world of general society, trying to cope and fit in. With little formal education and no writing background whatsoever, she wrote The Informationist over a three year period. It’s no coincidence that the setting of this book is in East and West-Central Africa, where Stevens lived for four years. The Vanessa Munroe series, now on its third book (with a fourth in the works) has received critical acclaim and the books are published in twenty languages. 1. You can make a living from writing - not unless you’re James Patterson or Lisa Scottoline. 2. Writing is an art - If you want to be a bohemian writer for self fulfillment that’s okay, but publishing is a business and if you don’t write what people want to read then you won’t sell books. 3. Authors have control over what happens to their books - the only thing you control is words on the page and you may have to even fight for some of those. 5. Writing is about the writing - No again. There’s a threshold that the average reader will tolerate. They won’t read below a certain level of writing and won’t read above a certain level of writing. You just need to be within that threshold. Most read because of the subject and the story, not the quality of the writing. There are some authors who's writing isn't that great, but they sell a ton of books. The writing has to be good enough, not perfect. 1. I have an idea. How do I get it published? Write a book. Ideas don’t get published, books do. You have to be a big name or have a track record to sell a book that isn’t written yet and even the big names usually have to submit a synopsis and outline. 2. How do I find a publisher? You don’t, your agent does. 3. How do I find an agent? Research, then research some more. Do your homework. A few places to research are Publisher's Marketplace and Agent Query. Make sure the agent represents your genre, is taking new clients and accepts email queries. Go to the agent’s website and read the submission guidelines. Do EXACTLY what it says. Stevens was fortunate enough to have had two agents interested in her. She went with the one who scared the crap out of her because the agent was tough as nails and Stevens knew the agent would fight for her. 4. How do I write a query letter? Stevens was not specific on this, but she did offer suggestions on how NOT to write a query letter. Check out Query Shark and Slush Pile Hell. 5. Should I self-publish? This is a very personal question that only you can answer. The pros are: you can keep more money; you’re in control; you get your book in print faster. The cons are: it's a lot of work and if you don’t know how to do it all, editing, marketing, promotion, social media, etc. you are at a disadvantage; it’s hard to get discovered when you self publish. Stevens described the traditional publishing route in a very entertaining way. Her book is a car built out of legos and it’s a Toyota. She gives it to her agent who pulls it apart, removes some things, adds some things and gives it back to Stevens. Stevens rebuilds the car and it’s now a Mercedes. Then the book goes to the editor who pulls it apart, removes some things, adds some things and gives it back to Stevens. She then rebuilds once again and now she has a Lamborghini. The public only sees the Lamborghini. As you can see, I paid attention and took copious notes, while laughing all the while. If you have a chance to hear Stevens speak, whether it’s at a writing event or an author event, I recommend seeing her. She’s worth your time and is one author to keep an eye on. This year marks the 80th anniversary of the repeal of Prohibition and as such Mystery Playground (and fun loving friends) is visiting modern speak easy bars all over the United States in recognition. 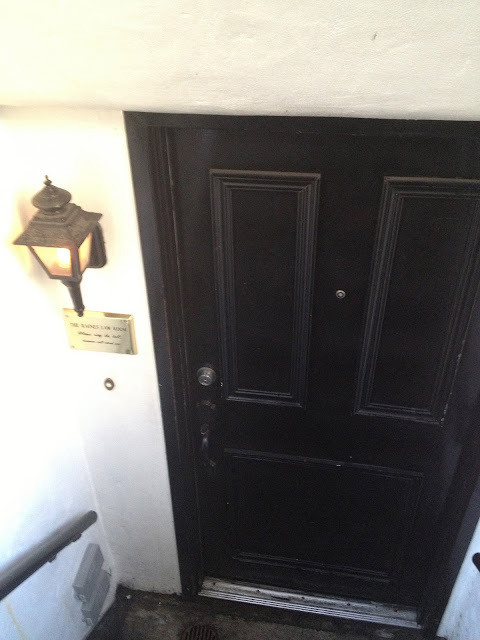 The latest in our series took us to The Raines Law Room in New York City. The Raines Law Room is named after an 1896 law which said that bars could not serve alcohol on Sundays unless they were affiliated with a hotel. Since most laborers only had one day off - Sunday, this meant they couldn't in effect go drinking unless it was in a hotel. The law intended to keep them from drinking. What it meant in reality was that bars sprung up as part of hotels that were thinly disguised brothels, compounding the possible vice on Sunday. The Raines Law Room may have taken it's name from the law, but it looks nothing like a brothel or dive bar. It is filled with velvet couches, a beautiful tin roof, and there's even a little garden in the back for clients who prefer to be outdoors on a warm spring night. I had the Sicilian Cobbler made up Camprari Lambrusco Frizzante, Campari, muddled blood orange & lemon. Served over crushed ice. It was fabulously refreshing. My friend Susan had the San Luis Cup. Del Maguey Vida Mezcal, Ancho Chili syrup, muddled lime & cucumber, dash of sea salt & black pepper. Shaken and stirred with cracked ice. She loved it. They have one food item and I have to warn you, it's not super impressive. It's a "cheese" plate that's really two bowls - one filled with hunks of cheddar cheese with toothpicks in them and a few pieces of salami and the other bowl with olives. We would have stayed longer if there had been a bit more to nosh on but we went right after work. The Raines Law Room is located on 17th Street between 5th and 6th streets. There is no sign outside, but the address is clearly marked. You enter in the door above which brings you to another little door with a bell. No password is required. We made reservations for 7:30 pm, but we didn't need them on a Tuesday night. The people we met at the adjoining table said reservations on the weekend were a must. Speakeasies were secret bars that sprang up when the U.S. outlawed alcohol in 1919. Most speakeasies were housed in unmarked locations, many required a password to get in and some may have moved from place to place to stay ahead of the law. Many think the name came from patrons being told to "speakeasy" or to lower their voices so no one suspected they were serving alcohol. Today, there are many modern speakeasy bars that retain some of these traditions. They usually feature fresh ingredients in their food and drink, in discreet locations that lack signage. Some model the decor after the periods and some require passwords. You can read about Mystery Playground's other speakeasy adventures here. Today's guest post is from Kim Hammond. As I may have mentioned before in another post, one of my addictions is Etsy. I typically come across things accidentally while searching for something else. 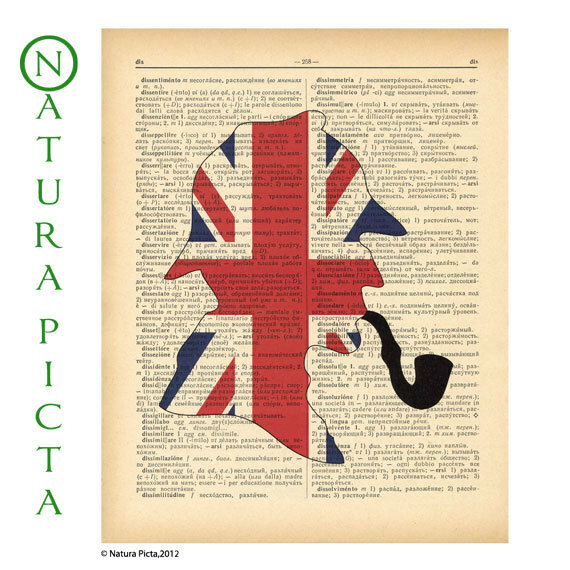 I previously purchased a Sherlock Holmes pendant from Natura Picta, but that’s not all they make. Take a look at these. Each print is printed on a vintage dictionary page that could be in any language. The background is not always the same as the picture above. Each time they do a print they use another page from rare book of a different century, from 1600 to 1900. It sounds like they rescue damaged books and save the good pages to use in their craft. This is not only a one of a kind gift, but an amazing conversation piece. Another addictive website is Pinterest.com. I can be on there for what seems like 10 minutes and when I look at the clock it has been over an hour. 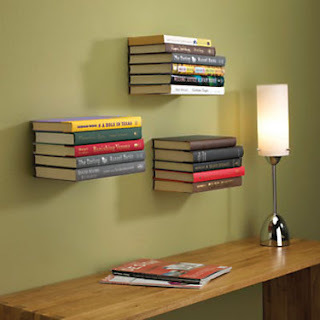 I can across a picture of a metal plate mounted to a wall and it was used as a floating book shelf. When 4-6 books were stacked you couldn’t see the metal plate anymore. I coveted this and I re-pinned it. That was 3 months ago and I finally came across these metal plates at www.umbra.com. Here’s what a single and double shelf look like. What you can’t see is the underside of the bottom plate. There’s a notch on each side and when you slide the back cover of the bottom book over the plate the edge comes to rest on the notches and stays in place. I found my shelves at The Container Store and I purchased the large size. When I got them home and picked out some of my coveted autographed books, I realized that the books weren’t wide enough to slide over the plate and reach the notches. My husband had to find me some of his old college text books to temporarily use until I can get to the used bookstore and look for some larger sized mystery books. So I recommend checking the dimensions because you may want to purchase a size smaller. Amazon also carries these. So before you make that next birthday, Christmas or Hanukkah purchase for the avid reader in your life, take a look at these websites for something more one of a kind. Kerry Hammond has a great review of The Baker Street Translation by Michael Robertson over on Criminal Element and we thought we'd share. The Baker Street Translation by Michael Robertson is the third book in the Baker Street Letters mystery series featuring Reggie and Nigel Heath, barristers whose office address happens to be 221B Baker Street in London. 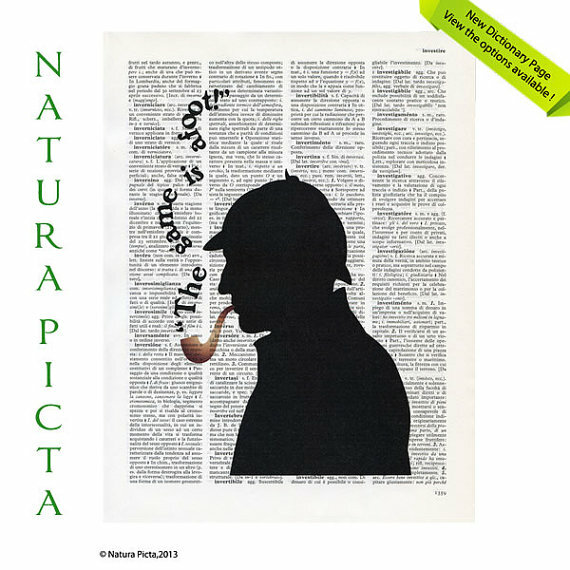 I am a big fan of anything Sherlock Holmes, and there have been many different spin-offs related to the master detective. You even see modern day Sherlocks on television, giving the sleuth 21st century cases to solve. What I loved most aboutMichael Robertson’s version is that it’s kind of based in reality; the reality of fiction of course. You can read the rest of Kerry Hammond's review here on Criminal Element.